The Manchester set offers you a sophisticated modern design, so it can adapt to the furnishing needs in your home. The outstanding furniture in the bed is the built in led lights in the headboard. Drawer fronts and headboard are accented with mirror and light oak finish decoration. 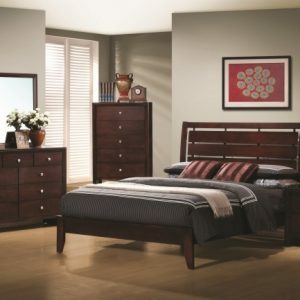 These bedroom set with bring an air of distinction and elegance to your bedroom and will match any modern home decor. Wooden slat system does not require a box spring.